There might be a few more seats available at district games this season, as the pro scouts may not be out in such large abundance like they were a year ago. There were about six or seven players who were drafted from this district last season, and many other who went on to play college baseball. Yet while the star power may not be as large, there are still some very talented players and talented teams fighting for this district crown. Some of that was showcased last season, when an upstart Jupiter Christian squad tossed a shutout to beat a very good Highlands Christian team. Westminster Academy also got a big, close win over dangerous Trinity Christian to advance to the district championship for the first time under Manager Nick James. Trinity Christian may again emerge as a tough team to get past, even despite graduating some big names. The Warriors return a deep pitching staff and a dangerous offense. Both Jupiter Christian and Highlands Christian have steadily evolved the past few seasons, and this year could also be their time to peak. There were some seesaw affairs last year, and the same will likely ring true this season. Mike Lord has over 30 years of baseball experience. In those years he has done everything from coach college ball to working as an international scout for the Boston Red Sox. Most recently he was the head coach at Trevecca Nazarene University in Nashville, Tennessee. So when a friend told him that Jupiter Christian was needed someone to fill the Manager position, he decided to take on the challenge. Lord, by his own admission, inherits a program that is in a rebuilding year. As a result of the young roster, the key to the beginning of the season will be player development. The first half of season will be about developing the talent, bringing the younger players along, and then focusing on playing their best baseball in April. Jupiter Christian returns a few key players off last year’s squad and Lord is going to be calling on those players early. Returning are seniors Matt Richter and Alex Gomez, and juniors Nik Constantakos and Sean Farmer. 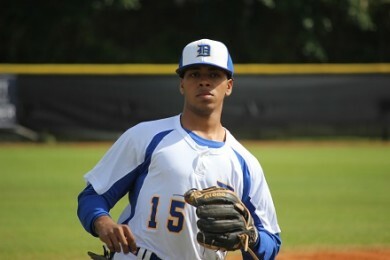 Speedy shortstop Yazir Braafhart sits atop the Defenders’ batting order. The Lake Worth Christian Defenders have been in a rut over the past few seasons, winning only 15 games since 2012. To help turn things around the school brought in new Manager Kraig Lawrence, who immediately set to work trying to redefine what Defenders’ baseball is all about. The new mantra at the school is “Family, Tradition and Excellence”. The team does not have too many holdovers from last years’ club to see the difference in attitude, other than Jordan Marrs, but he is buying into it wholeheartedly. Even though he is working with a roster comprised primarily of newcomers to the school, and in some cases, to the country, Lawrence is not one of those Managers believes they need to bide their time before achieving success. He thinks his team can be competitive from the start and is trying to instill the same confidence into his players. Those pitchers seem to have him particularly excited and optimistic. One is Marrs, who worked hard to improve his velocity over the break, and the other is Orsen Josephina, a transfer from the Caribbean island of Curacao. Josephina is aware of the Defenders’ recent troubles and is eager help them turn things around. 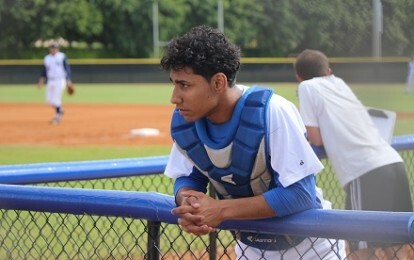 Catcher Anthony Padilla is one of the team’s most improved players. The pitching staff is deeper than just he and Marrs, however. Lawrence also expects Trevor Huffman, another of the few returners, to play a role. For as solid as their pitching is, the Defenders’ Manager is concerned about their offense. The team has a lot of what Lawrence calls “athletic guys” who are not necessarily pure baseball players, so it may take some time for them to find their groove at the plate. Two guys he expects to lead the way are Yazir Braafhart and Anthony Padilla. 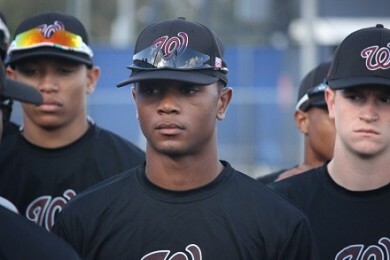 Braafhart is another transfer from Curacao who will play shortstop and occupy the lead-off position in the batting order. He is a speedster who posted a phenomenal .838 on-base percentage in his fall league. Padilla is another returner from the 2014 squad who Lawrence claims has improved dramatically since his arrival as manager. “He’s turned into a nice little power hitter, good catcher behind the plate,” said Lawrence of the junior. The Defenders play in a tough district 3A-14 and will have to contend with some steep competition in 2015. With a new Manager, the continued development of some key returners and some contributions from the recent transfers, they should be able to hold their own. So long as they remember three simple words: Family, Tradition and Excellence. The 2014 spring baseball season was a new experience for the Trinity Christian Warriors. For the first time they were part of a district, which meant that for the first time they had something to play for, a definitive goal: to win the state championship. Although they did not achieve that goal, they did make an impressive showing, posting a 20-4 record in the regular season before falling to Westminster Academy in the district semifinals. Senior Bruce Martin, was a big part of the team’s success. 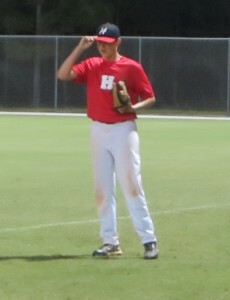 He scored 34 runs, second most in Palm Beach County, while posting an impressive .463/.583/.675 batting line. He admitted that dealing with the pressure of playoff baseball might have taken a toll on the team during the loss to Westminster. This year, the Warriors will be looking to get that “vibe” back and their goal remains the same. 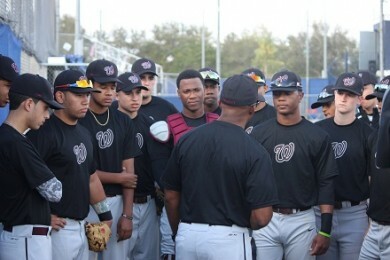 They want to pick up where they left off, win the district title and then keep on marching all the way to jetBlue Park, where the state tournament is held. That is exactly what the Warriors did. They won their first six match-ups of the season by a combined score of 46-16. Later in the season they went on another tear, ripping off 10 straight victories to solidify their position as one of the top teams in the county. Duplicating last season’s accomplishments will be no easy task for the Warriors, however. Other than Martin, all of the main hitters have departed via graduation, taking with them the power that helped the team to a .458 slugging percentage. Miguel Cuello believes that there are plenty of underclassmen waiting in the wings, though, and that many of them are ready to make an impact. One such player is Xavier Edwards, who saw a plenty of playing time as an eighth-grader in 2014. His continued development will play a part in the Warriors’ fortunes this season and he is ready to take the next step. That speed will be a key factor in Cuello’s offensive strategy in 2015. Rather than relying on power at the plate, Cuello says the team will be more active on the base paths. They will manufacture runs by using their speed and aggression to get into scoring position and then take advantage of the opportunities. Martin is buying into the strategy. Bruce Martin steps into a leadership role for Trinity Christian. Junior Edmond Americaan and senior Shadrach Muelens, both of whom batted over .300 in 2014 are also returning and should help to keep the Warriors’ lineup dangerous. On the other hand, Braxton Stowe, another standout from a year ago, will likely miss the season with a knee injury. The team also lost a pair of quality arms, Richard Moesker and Emilio Pena, courtesy of graduation, and another Dorian Kemp, to transfer. This year, pitching duties will be more of a piece-meal operation, according to Cuello. The team has a plethora of potential hurlers but at this point many of them are an unknown commodity. He wont expect more than three or four innings at a time from them, at least until he gets their arms stretched out. Among them are senior Yerson Rosalia, who did not allow a run in 10 innings pitched last season, and Brandon McCabe, a transfer who fanned 85 batters for Boynton Beach. While the Warriors will certainly miss their departed seniors, the infusion of young talent should help to ease the blow. Combined with a better understanding of the kind of competition that comes with playing in a district, that should make them a formidable challenger for the crown. *Oxbridge Academy also in district. Report unavailable.